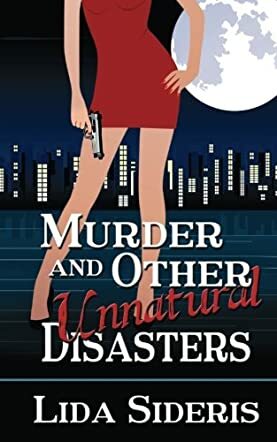 Murder and Other Unnatural Disasters by Lida Sideris is a humorous mystery story. Corrie Locke used to be a private investigator, but when her father died, she gave it all up. Instead, she became a lawyer. Now she’s about to start a brand new job as a lawyer for an entertainment firm, a nice safe job – or it should have been. On her first day she gets roped into investigating a suicide and finds herself chasing a murderer. She teams up with the most unlikely of characters and a whole host of somewhat shady weaponry she probably shouldn’t have. The suspects are flying thick and fast and Corrie is right in the line of fire. Can she unearth the murderer before her time is up? Murder and Other Unnatural Disasters by Lida Sideris is an excellent read. It has everything needed for a cozy afternoon curled up on the sofa – murder, mystery, humor, and plenty of action. The plot is extremely detailed and so well written that I found myself hooked on page one. As the story gets deeper, so do the hooks and I really couldn’t put this down until I got to the end. There are plenty of twists in the story and the main protagonist is also working on two other cases that keep popping up throughout the book, all drawing neatly to their natural conclusions. The characters were very likeable; you couldn’t help but identify with them and find yourself rooting for one or two as well. Excellent story, I really enjoyed this read.